Find out about an industry and a way of life that has vanished forever Woodhorn Colliery and the people who worked it were typical of a way of life that has vanished forever. So what was coal mining really like? 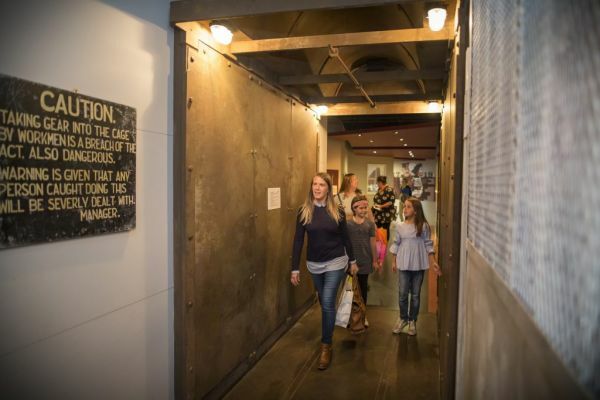 Explore Coal Town, an engaging and interactive permanent exhibition. Through the eyes of the Ashington community, you’ll discover the true story of coal mining in Northumberland. You’ll set off in 1918… walking to work… at one in the morning… As the decades fly by, you’ll encounter some fascinating folk. They’ll take you into their homes… on picnics… marches…even on strike. You’ll cram into the ‘cage’ like a sardine, experience the joys of washday, learn to love leeks, discover the art of the ‘Proggy’, and the power of community values. This experience is included at no additional cost as part of your Museums Northumberland Annual Membership where children can visit for free. Membership is required for entry onto the museum site. Membership Prices for Woodhorn Museum: Adult: £7.00 (Multiple adult purchased at the same time: £6.50). Concession (OAP and student) £6.00 Children 16 and under are admitted free at all Museums Northumberland venues. *Membership is valid for 12 months and includes unlimited return visits but please be aware that parking charges still apply on FREE community event days at Woodhorn Museum including Invasion Day and the Northumberland Miners’ Picnic. Concession (OAP and student) £6.00\r\nChildren 16 and under are admitted free at all Museums Northumberland venues.